DETROIT >> If there was any player that needed a fresh start it could definitely be Jakub Kindl. And he got that when his former coach, Mike Babcock, left for the Toronto Maple Leafs and the Wings hired Jeff Blashill. “When you look around, it’s not just me,” Kindl said. “I think we’re all on the same page. New coaching style, he’s got new plans, he’s got new visions. I’m just here to … again, let’s hope I have a bigger chance. Kindl could never seem to play his way out of Babcock’s doghouse the last two seasons with his lack of competitiveness always being cited as to the reason why many times he was a healthy scratch. A fine example of how things had gone for Kindl under Babcock came last season. After sitting out a month he returned for one game and registered a goal, an assist and was a plus-1. He was a healthy scratch the next nine games and didn’t make his way back into the lineup until the regular-season finale. Kindl, 28, also appeared in just one of the seven games in the first round playoff series with Tampa Bay, the series finale. So far things appear to be heading in the right direction for Kindl, who’s battling for a spot on the third blue line pairing with Kyle Quincey and Brendan Smith. He’s got a goal, two assists and is a plus-2 in his first two preseason games. “I think every year is different for every player, in both ways,” Blashill said. “Sometimes when it hasn’t gone as well there’s a chance to have a good year and vice versa. Kindl, who had a career-high five goals in just 35 games last year, is no stranger to getting power play time, averaging just under two minutes a game last season. It’s on the penalty kill he’s beginning to learn the ropes on. 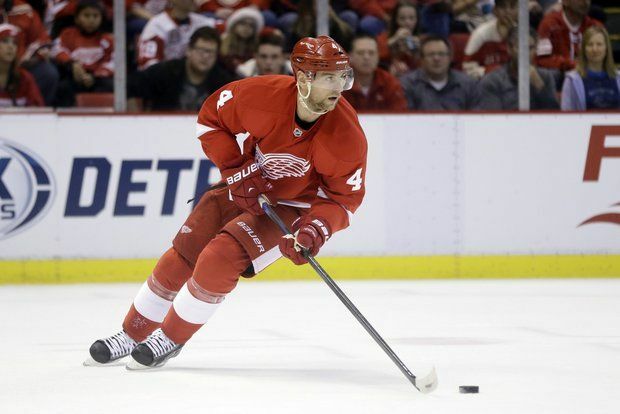 Blashill has liked what he’s seen so far from Kindl. Kindl finished with 13 points last season. DETROIT >> Dylan Larkin didn’t hesitate at all when asked if he’s doing all he can to make the Wings’ decision on where he starts the season. Larkin finished with a pair of goals in the victory in just over 15 minutes of ice time. “I couldn’t help but smile,” Larkin said about first goal with the Wings. “It was a real cool feeling to hear that goal horn and put it in the back of the night. Somehow I’m going to remember that for a long time. He also had one disallowed when Tyler Bertuzzi was called for being in the crease. “He’s got to be better today than somebody else that would have that spot,” first-year coach Jeff Blashill said when asked if Larkin could make this roster. “Better means lots of things. Better means playing a good 200-foot game. Better means within the role that he would be competing for. He then had a goal and four assists at the Prospects Tournament prior to training camp as well. But like many in the Wings’ organization, they really young players to mature in the American Hockey League before joining the NHL club on a fulltime basis, just ask Gustav Nyquist. Larkin, who is very competitive and plays a 200-foot game, back checks hard and is conscientious defensively, has said he won’t be disappointed if the team decides to have him play a full season with the Griffins. DETROIT >> If this is how the regular season is going to go for Tomas Tatar it’s going to be a very successful offensive one. Tatar scored three goals, the last coming in an empty net, to lead the Detroit Red Wings over the Chicago Blackhawks, 4-1, Wednesday at Joe Louis Arena. 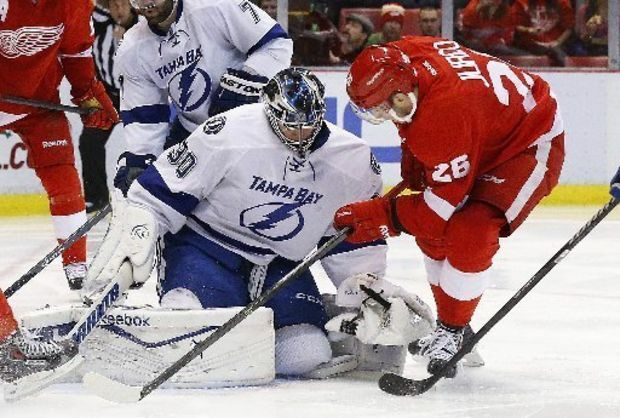 “Every season after the one before you try and change yourself to be better,” Tatar said. “At the end I want to one of those guys like Hank or Pav. I want to be a leader. I would like to pick up as much experience from those guys. They’re great hockey players. They’re great examples for us young hockey guys. It was also his first game with his newest linemate Brad Richards. Richards assisted on all three of Tatar’s goals. Tatar and Richards worked a nice give-and-go in the Blackhawks’ zone for the first goal of the game. Tatar and Richards each finished a plus-3. “He knows how to score,” Richards said. “I like that. He finds ways to score. One of them was a great shot from the slot and the other one he’s going to the net and he’s in a hard area, even though he’s not the biggest guy. This is exactly the kind of chemistry first-year coach Jeff Blashill was hoping to see out of that line. “Tats is a real, real talented player who competes extremely hard, has a lot of confidence and wants to win badly,” Blashill said. “He’s got a lot of attributes that make you a real good player and I think he’s continued to progress and we’ll work together to make sure his game continues to progress. The Wings signed Richards on the first day of free agency after he had just won the Stanley Cup with Chicago. Tomas Jurco, who’s replacing Darren Helm on the line after he was injured on the first day of training camp, also finished a plus-3. “It’s a tough game,” Tatar said. “It’s the preseason. We’re still working on the system. We have lots of stuff to work on. I didn’t feel the best on the ice. I found spots that I need to work on and be better in the system. Tatar is in the second year of a three-year deal that has an average salary-cap hit of $2.75 million. Darren Helm has been here before. But as far as his past injuries goes, this latest setback is in a whole different category. “I was thinking about my injuries lately,” Helm said Monday. “I feel like this isn’t really a hockey injury, just an unlucky situation that I was in. I’m going to chalk this one up to bad luck. On Friday, just minutes into the first drill at training camp in Traverse City, Helm and prospect Jerome Verrier got crossed up during a drill and collided. Helm suffered a Grade 1 shoulder separation and continues to go through concussion protocol. Verrier suffered a broken right leg and also a concussion. “I didn’t even get my head up quick enough to see him,” Helm recalled. “I was kind of looking back for a pass. I was expecting him to be going up the other side. Somewhere between there, the drill got kind of messed up and both of us were going down the same lane. Helm is expected to miss two-to-four weeks. Helm has suffered concussions before, the last sidelined him roughly a month during the 20-13-14 season. “I’ve been feeling a little off, a little bit of a headache,” Helm said. “I think we’re going to jump on the bike (Tuesday) and see how that feels, get the heart rate going, take it from there. Helm has a laundry list of injuries which include groin, broken nose and knee. He also lacerated tendons in his forearm when he was cut by a skate blade in the playoffs. He injured his back while lifting weights. Helm played his most regular season games, 75, a year ago since appearing in 82 during the 2010-11 season. 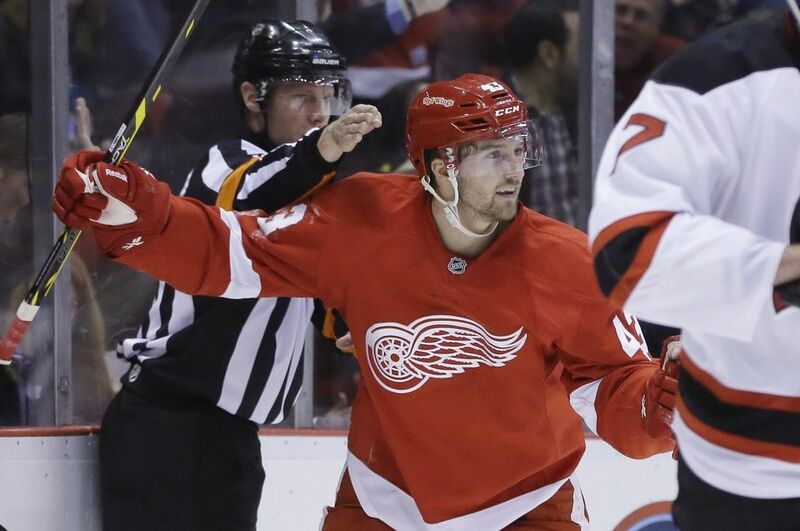 The timing could not have been worse since Helm was scheduled to skate on a line with Tomas Tatar and Brad Richards, who the Wings signed on the first day of free agency. Tomas Jurco has officially been put on notice. “Jurcs is one of those guys that’s in a spot and he knows it,” Detroit Red Wings coach Jeff Blashill said after the second day of training camp in Traverse City. “He’s had an opportunity to play up here for a year and a half, basically. Blashill appears to be giving Jurco ample opportunity to show if he’s an NHL player or not, slotting him on a line with Brad Richards and Tomas Tatar after Darren Helm was injured on Friday. “For now, then probably (Sunday) and maybe the red and white game,” Blashill said when asked if that’s where he plans to keep Jurco. Jurco struggled mightily last season in Detroit. Despite playing in 27 more regular season games than he did his first season, he scored five fewer goals. Jurco had three goals and 15 assists last season, compared to eight goals and seven assists in the 2013-14 campaign. While in Grand Rapids, Juro had 27 goals and 47 assists in 106 games over two seasons. Blashill took over behind the bench for Mike Babcock, who had coached the Wings for the past 10 season. “Providing more offense is the main thing for me,” Jurco said in the days leading up to training camp. “I’ve been working hard all summer, to get stronger, faster, so I think it’s going to help me. Jurco, who missed eight games last season with a back injury, went 39 games without a goal a year ago. Despite his struggles he was only a healthy scratch in five games with Babcock, who used Jurco more in a grinding role. DETROIT >> It’s full speed ahead for Johan Franzen. After being cleared Thursday, the Detroit Red Wings power forward can’t wait to start getting “bumped around” on the ice. “I’m cleared to try, I guess,” Franzen said Tuesday during the team’s last informal practice before heading to Traverse City for training camp. “It’s going to be fun to start training camp and play a few games. It’s too early to tell, to know how I’m going to feel. I think I’m going to feel good and I hope I’m going to feel good, so I’m excited. Franzen, who has been taking part in informal skates these past few weeks, has suffered multi concussions in his career, the last of which occurred last season after a blind-side hit by Edmonton’s Rob Klinkhammer last January. He finished the game, but began experiencing concussion-like symptoms the next day. Franzen, 35, said the headaches aren’t completely gone, but they’re not as severe. “I’ve got one right now, it’s not that bad,” Franzen said. “It could be just a regular headache. You can’t blame anything on previous concussions, it could be just a regular headache. Franzen, who has been limited to just 128 regular season games over the last three seasons, played in 33 games a year ago, picking up seven goals and 15 assists. “First of all, it’s great for him,” Wings first-year coach Jeff Blashill said. “As an athlete, you certainly want to dictate your terms of how your career goes and he gets an opportunity right now, being cleared, to go out and dictate his terms. Franzen, who has 187 goals and 182 assists in 600 regular season games with the Wings, said he’s not going to think about the possibility of suffering another concussion. Franzen added he expects to play in four of the Wings’ eight preseason games, which begin next Tuesday in Chicago. The Wings open the regular season on Oct. 9 at home against the Toronto Maple Leafs. DETROIT >> Johan Franzen got the news he had been hoping for all summer … he’s been cleared to play. 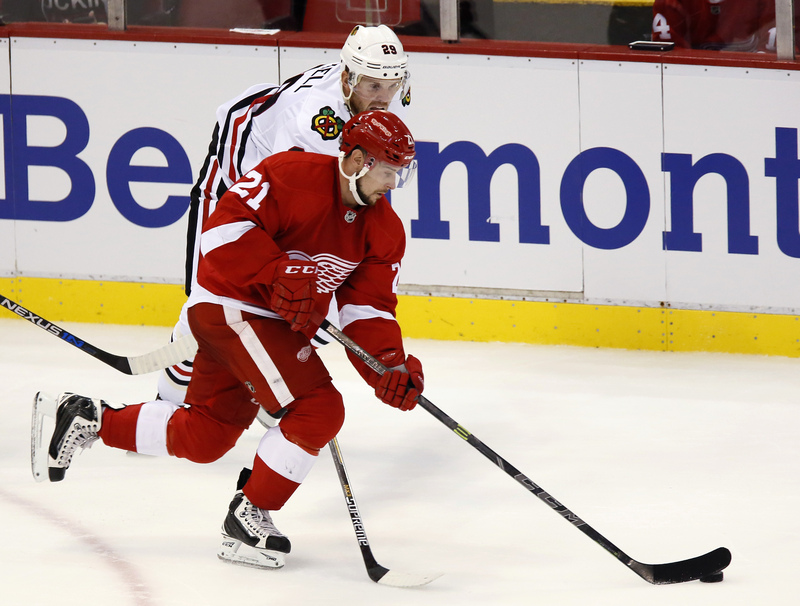 Detroit Red Wings general manager Ken Holland confirmed the news Saturday afternoon. “He’ll start camp and is expected to be ready for the start of the season,” Holland said. Franzen was cleared by Dr. Jeffrey Kutcher, director of the Michigan Neurosport Program. Franzen, who has been taking part in informal skates with teammates at Joe Louis Arena these past few weeks, has suffered multi concussions in his career, the last of which occurred last season after a blind-side hit by Edmonton’s Rob Klinkhammer. He finished the game, but began experiencing concussion-like symptoms the next day. He said earlier this month that he had yet to consider his career possibly being over because of last season’s setback. “I haven’t been there yet, really, in my thoughts,” Franzen said when asked about the possibility of retiring. “It’s been so many tough years here the last 2-3 years with injuries. I just want to have a good year. I want to decide on my own when I quit. I’m excited to try to get back and to have a good year. Franzen has been limited to just 128 regular season games over the last three seasons. Franzen played in 33 games last season, picking up seven goals and 15 assists. Franzen, 35, has 187 goals and 182 assists in 600 regular season games with the Wings. He has 42 goals and 39 assists in 107 playoff games. He’s as streaky of a goal scorer as they come. After a five-goal game against Ottawa during the 2010-11 season, Franzen went on a 14-game goalless drought and ended the regular season with just two goals over his last 27 games. “He’s another big body that’s got skill and gives us more depth up front,” Holland said. After this season Franzen still has four years left on a contract that pays him just under $4 million a season.